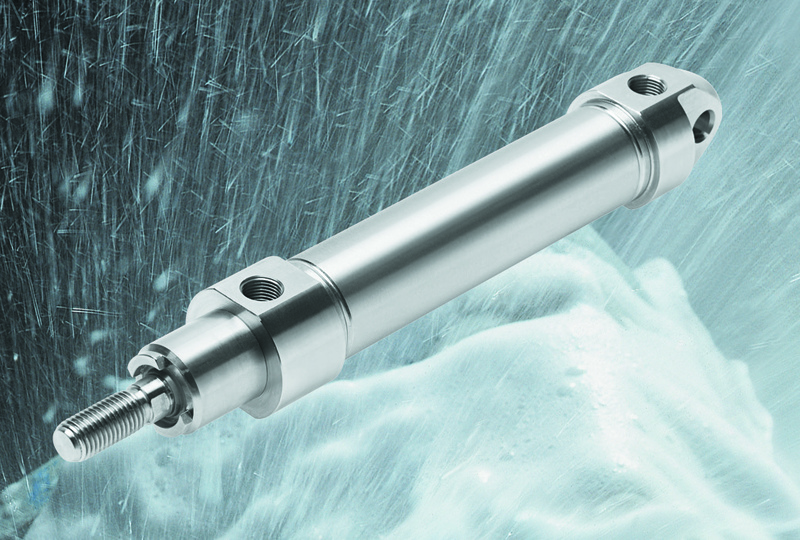 The latest generation of Festo’s popular CRDSNU round stainless steel pneumatic cylinders boasts new variants and installation possibilities for extended and contaminant-free operations. Based on the ISO 6432 standard and ideal for operations in harsh environments or where frequent and effective cleaning is a must, CRDSNU now offers options like an extremely long-life dry running seal as well as self-adjusting end-position cushioning. CRDSNU cylinders are widely used in food and packaging, chemicals and medical technology as well as in resource extraction. Their design rigorously conforms to “Clean Design” criteria. Variants are available with threadless front mounting which reduces the risk of contamination. Festo’s proprietary self-adjusting cushioning PPS does away with the adjusting screw, another place contaminants may lodge. The new long life dry running seal ensures reliable functioning even when the cylinder’s food grade lubricant film is washed off the piston rod surface through intensive cleaning. It’s resistant to even the most aggressive media. Nevertheless, if a replacement dry running seal or hard scraper is needed, the cylinder’s two-part split bearing cap allows a new one to be installed quickly and easily without de-installing the cylinder, considerably reducing system downtime. The CRDSNU line includes variants and mounting options suitable for almost every application, including low-temperature and heat-resistant versions and various piston rod setups: through piston rod, extended piston rod thread, or piston rods with female or special thread. All Festo stainless steel cylinders are made from highly corrosion resistant 1.4301 and 1.4401 grade steel. These high-alloy, stainless austenitic chrome/nickel and chrome/nickel/molybdenum steels protect against chemical or electrochemical stress as well as damage to the material surface caused by cleaning or detergents.